The Flames of War website has been updated with several new articles. Pimp Your Bunker Part I: Modelling & Painting Having had a hand in designing the new line of bunkers, I was extremely excited to have a crack at pimping one out with all the bells and whistles that were too difficult to include in the model. I have a passion for both bunkers and terrain modelling, so the chance to combine the two was one I couldn’t resist. I gathered several of my favorite bunker books and set to work. Guns and Guts: Tank Destroyers in Combat In my mind, the only thing cooler during World War II than a tank is a tank killer. It takes a special type of soldier to actively seek out enemy tanks and destroy them with stealth, speed, and cunning. The tank destroyers (or TDs for short) are often hidden behind the dashing and famous exploits of their tank brethren. With a few exceptions, such as Harry Yeide’s excellent book The Tank Killers, tank destroyers have been unjustly overlooked. 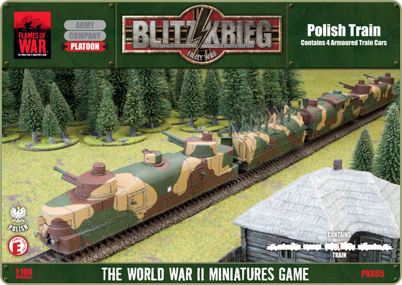 A Sneak Peak at the Polish Train Armoured trains were critical to Poland’s survival prior to World War Two and even in 1939 were still considered to be an important part of the army. Equipped with a staggering array of firepower these trains were capable of providing mobile artillery support to attacking Polish forces, while their armour and mobility meant they could also cover a withdrawal. D-Day Scenarios With the release of the new D-Day compilations, Turning Tide and Earth & Steel; the scenarios that featured in the original books were omitted in order to make space for all the new army lists. However, we didn't want these to disappear altogether so we decided to provide the scenarios featured in these books as PDF downloads for your enjoyment. The Beginnings of the Waffen-SS: Part One The Formation Politics in parts of Europe between the wars could sometimes be a dangerous endeavor and Germany was certainly in that category. The competing radical factions within Germany were not unusually literally fighting for control in sometimes armed conflict. During the 1920s, the National Socialist German Workers Party (NASDAP, often verbally shortened to Nazi) formed Shutz Staffeln (SS), or protection squads to provide local security for party officials, while the Sturmabteilung (SA), also known as the Stormtroopers or Brown Shirts handled active enforcement and strong arming against political opponents. Individual Defences The Defences set provides you with all the necessary fortifications needed to hold off your opponent’s forces. Using wire, mines, trenches and obstacles you can create your own impenetrable fortress for your troops. Now individual sections of the Defences box set are available via Special Order. Flames Of War on YouTube Jeff Brooks demonstrates how to paint the German Panzer IV/70, the Soviet 76mm Sherman and the SU-100 from Stalin's Europe. Death on the Hungarian Plains! In WI277 Blake and Victor went head to head with a pair of armies based from our new book, Stalin's Europe. We won't spoil the ending but Blake's M4 76mm lend lease Shermans and SU-100s went head to head with Victor's Panzer IV/70(V)s and Zrínyi IIs. For a limited time you can buy the armies that were fielded in the battle report (and get some of these new vehicles before they are officially released) - numbers on both army deals are strictly limited. Orders will ship in a couple of weeks as the deals are currently sailing their way to our local warehouses right now!.